Environmental Research Letters (ERL) is relatively new scientific journal. It was first published in 2006. ERL deals with different environmental issues and climate change is one such issue. I checked all ERL issues for climate change related papers (between 2006-2014) and the results are presented below. Papers that relate to climate change are very diverse in their subjects. The papers are dealing with the climate system, the carbon cycle, climate change impacts (in biosphere for example), and climate change mitigation, to name a few. ERL publishes papers on all these. ERL publishes also some perspective articles for the studies published in ERL. Perspective articles have been excluded from this analysis because I wanted to concentrate on original research articles. Also corrections have been excluded (as they only add to an existing study). It should be noted that this analysis is based mostly on paper titles. Only in few cases where title has not been clear but has suggested the possibility of being climate change related, I might have peeked the abstract of the paper in question. According to my results, ERL has published 1348 research articles in years 2006-2014. Of these, 888 papers relate to climate change. 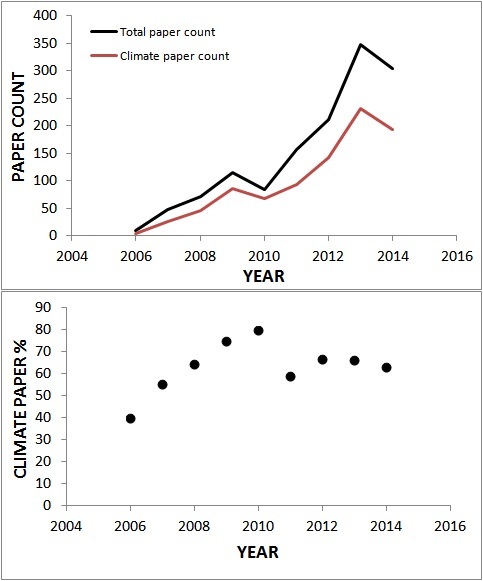 The percentage of climate papers is then about 65.9%. In my opinion, this is quite high percentage. Perhaps it shows that among environmental issues, climate change is an important one. This also raises a question about whether ERL should concentrate a bit more on the other environmental issues in addition to climate change. With two thirds of papers being climate change related papers, perhaps it could be argued that ERL actually is more a climate journal than environmental journal. A peek to the papers reveals further that among the climate change related papers, ERL has published some papers that are more climate science than environmental science, although this distinction might not be very clear these days. I’m not suggesting that this is a bad thing, though. Figure 1 shows the evolution of annual paper counts (top panel, total paper count in black and climate paper count in red) and the evolution of annual climate paper percentage in ERL (bottom panel). Paper counts increase from 2006 to 2013, but there is a drop in paper counts from 2013 to 2014. Reason for this is not clear. Between 2013 and 2014, ERL did switch from 4 issues per year to 12 issues per year but I’m not sure how this should affect the published paper count. The climate paper percentage increases from 2006 to 2010 and then drops and stays relatively stable after that. Reason for this is not clear either. Perhaps they noticed that they are turning into climate journal and made some corrective maneuvres. I won’t include the list of ERL climate change related papers here, but the list (containing the journal volume & issue, publication year, paper title, and paper’s URL) is available upon request. Today I fooled around with Google Scholar a bit. During this, I searched for papers matching the exact phrase “climate change” for year 1903. For this search, Google Scholar returned 59 “papers”. But when I looked the results more closely, I was rather disappointed. Let me tell you why. There’s this website, kbd.kew.org, that has a link named as “Kew & Climate Change” in their bottom link bar which appears in every page of the site. Google Scholar catches this as a “citation”. 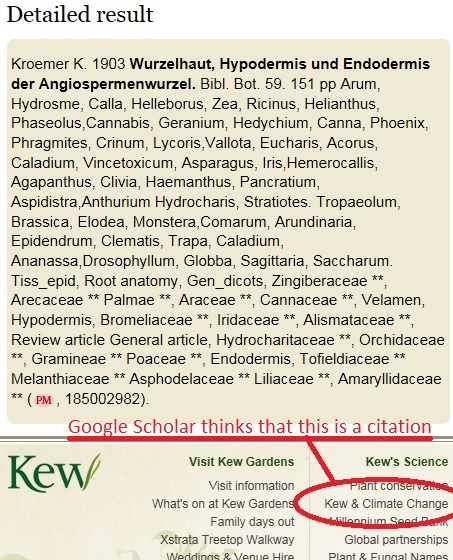 This website of Kew Royal Botanic Gardens has in it “Kew Bibliographic Database” which contains entries of scientific papers, and rather lots of them and many are old ones, too. This results in Google Scholar finding that all the papers in the database match the search criteria. For more modern searches this doesn’t matter much as there are plenty of search results for “climate change” so this kbd.kew.org thing just adds a bit noise to the results. However, when searching for historical papers this flaw can make the search results meaningless as almost all the results are due to the Google Scholar’s flaw. Fortunately, Google Scholar has an option to exclude the citations from the search (citation results can be useful, but I wonder if they should be included by default). If we exclude citations from the search above, we only get 5 hits. Of these, 3 are still from kbd.kew.org. At first glance it is obvious that this is not a peer-reviewed publication and second glance tells that it’s not from 1903 either. Apparently the document is from 2013. It also is not about climate but seems to contain all kinds of stuff, and one section does mention “a documentary about the effects of climate change on the oceans, as told by a grandfather to his 5-year-old grandson”. So, using default Google Scholar exact phrase search for “climate change” returned 59 results but none of them actually matched the intended search. One can argue that the article from The British Medical Journal is a quite good hit but beyond that Google Scholar returned just rubbish – 58 bad hits for one almost good hit. Furthermore, this simple little search revealed four flaws in the Google Scholar’s search process; 1) the method for searching the citations is rubbish, 2) returned results are not always scientific documents, 3) the year assigned to document is sometimes wrong, and 4) the exact phrase search returns papers not having the exact phrase the exact phrase search catches extra phrases because it ignores special characters. Also, while not actually a flaw, the choice to include citations (and patents) by default is a poor one, in my opinion. It might be kind of nice to have an access to real scientific search engines. In February, I stopped providing daily new climate research posts in social media. However, I still keep an eye on new publications. Below are some new climate related papers February and March 2015. They are not ordered by subject but roughly by publication time. There are 155 papers in the list.